Why is dowry a bad idea? 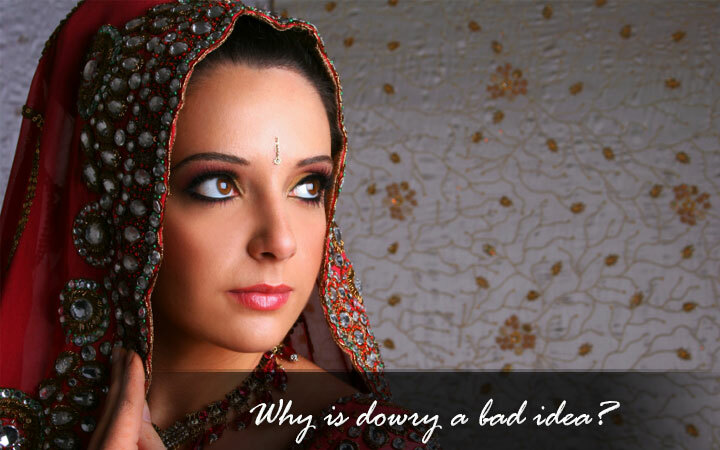 Why is dowry a bad idea, a topic which is important and something to think about. Any gift in the form of cash or kind that the bride’s parents are forced to give to the groom and his family comes under the purview of dowry. However, any gift, property or cash that the bride’s family gifts the bride and the groom as free will is not considered dowry. The total concept of forcing the girl’s family to part with cash or property as ransom, or on the threat of not holding the marriage, is unjust. With millions of women tortured and killed in the name of extracting more money from their parents and families has led a tradition of endowing the girl with gifts to be twisted into a hideous form.The total idea of dowry is bad. Though there are regulations against people asking for dowry under the guise of ‘gifts’ but it does continue. People do not realize that marriage is about union of two people and families coming together. It is not supposed to be a business deal but a spiritual, emotional and physical union. Marriage should be associated with happiness, a beginning of a new chapter in your life, not about threats, worries and financial debt. However, the bride’s parents need to realize that a groom or his family that demands dowry is not the right choice. Till the bride’s family continues to give on demand, the system of dowry will never end. They need to do a reality check and understand that their daughter is precious and needs to be married to someone who cares and values her and is not marrying her for the dowry.